By way of celebration, I am honouring one of the things that has most surprised (and then touched) me about this story: how much I enjoyed writing Bingley’s younger twin sisters, Olivia and Viola, and by the response to them from readers. Bringing original characters into a story peopled with those we have all loved for so many years is a daunting prospect, so I thank each and every one who has ever told me they enjoyed the twins and their antics! As we’re talking twins, there have to be two things to give away. 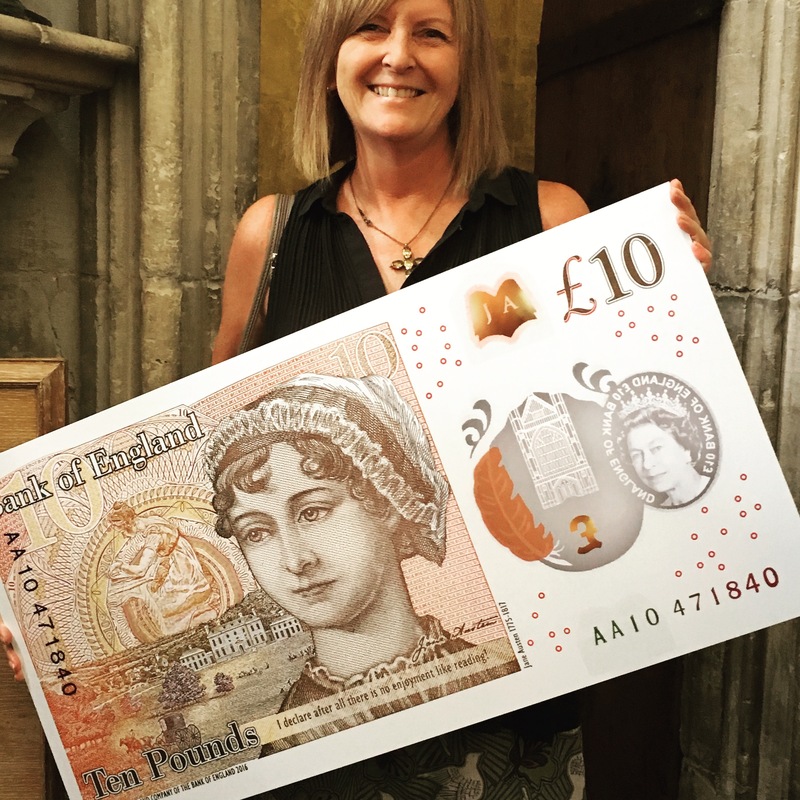 Some of you may recall I was in Winchester on the anniversary of Jane Austen’s passing back in July, where I attended the presentation of the new £10 note. It was a real treat to be able to hold one of the notes and see up close how very pretty they are! It was released into general circulation in the UK on 14th September, and by sheer good fortune, I happened to be in the country attending the annual Jane Austen Festival in Bath. Only a few select banks across the country had been sent the notes for this first day of release, and I had no idea Bath was one of them until I saw a local news report from Milsom Street! Recognising the ATM the reporter stood beside, I prodded my friends into action, and we were soon each holding one of these little pieces of history in our hands! One was never going to be enough, however, and soon I had in my possession a little pile of freshly minted, never been in circulation, immaculate £10 notes! 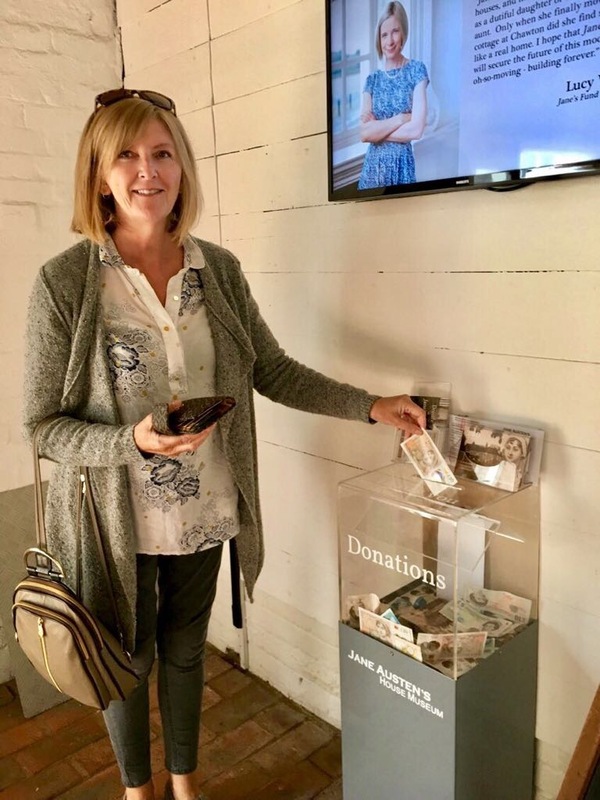 I donated my first £10 to the Jane Austen House Museum and their ‘Bring Jane Home‘ campaign when we visited there the following week. I have also passed some of these unused and very special notes to a few friends who would not likely come across one in the foreseeable future. However, I have two left over from that early raid on the cash machine, and I’m now going to give them away to two readers of my Blog! Oh, and you can find out why I gave Bingley three younger half-sisters (the hint came from Jane Austen herself, within the pages of Pride & Prejudice) at this link which announced the start of the story last year! NB: Giveaway will run for 4 days, closing at midnight UK time on Sunday, 15th October 2017. Two winners will be drawn randomly and announced here on the Blog. Unclaimed prizes will be re-drawn if not claimed within 48 hours. This entry was posted in Uncategorized and tagged A Quest for Mr Darcy, £10 note, Bring Jane Home, Giveaway, JA200, Jane Austen, Jane Austen House Museum. Bookmark the permalink. 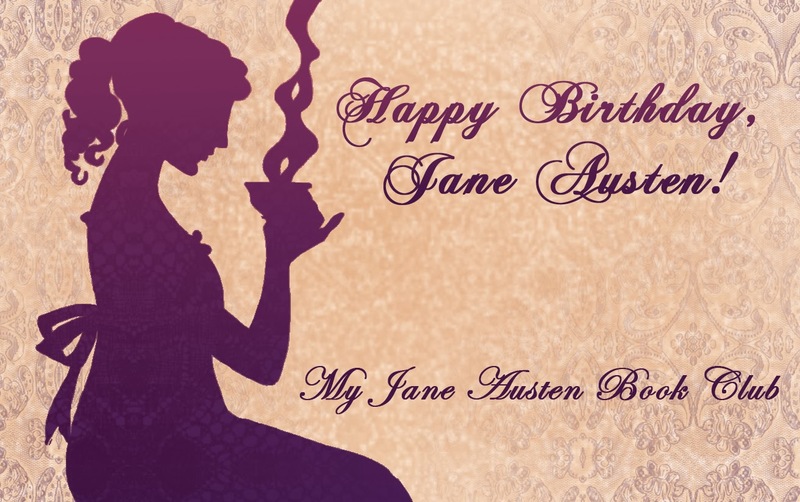 99 Responses to It’s a Quest Anniversary & a Jane Austen £10 Note Giveaway! I’m so pleased you enjoyed the twins, Stephanie! I hope you get to do the Jane Austen ‘tour’ in England one day! Good luck in the draw! What a lovely way to celebrate Quest’s first birthday. Is it really a year since you started to take us along on that wonderful ride? Obviously, you don’t need to put my name in the hat. I’m seeing Jane on an almost daily basis now, especially when I’m working, and I get a little pang every time I have part with one when I need to spend it! Wonder if that will ever go away? I can’t believe it’s a year either, Anji! I know exactly how you feel about not wanting to spend them! I feel exactly the same, lol! There is nothing wrong in being honest, Jessica! Good luck! Wow! I’ve been salivating over these notes and am not likely to make it overseas any time soon (if ever!) Would love to win! I hope you enjoyed Bath, Sheila, despite the limited time! I wish you could get back there to enjoy it at a more leisurely place, but at least you have seen it ❤ Such a beautiful place. Yes, it is very beautiful and I would love to visit again and spend more time! Has it really been one year!!! I can hardly believe it! Where has the time gone? I forgot that section of P&P about how many sisters Mr. Bingley had! I have actually been trying to figure out how to get my own Jane Austen note! No luck yet so was thrilled to seeing you offering a chance at one! My sister gave me a lovely ornament with Jane on it and I was planning on framing it with the 10 pound note! I can’t believe it either, Carole! It’s gone so fast, but I do miss the weekly interaction with everyone. Living in the states makes it hard to envision getting one of these! Friends were in London the week before they came out😟 We have no plans to be in England any time soon, so winning one would be delightful!! Thanks for the opportunity and I’ve placed the book on my wish list. Oh, bad timing, Lynn! What a shame they missed it! I too am a U.S. resident and a long ways away from getting one of the banknotes which I would love to have. Then I wish you good luck in the draw, Jerry! What a generous giveaway. Thank you so much! Being in the U.S., I don’t have much of a chance of coming across one of these. So unfortunate! I wish you good luck in the draw, Anna! I was just wondering (hoping) yesterday if you were writing again. 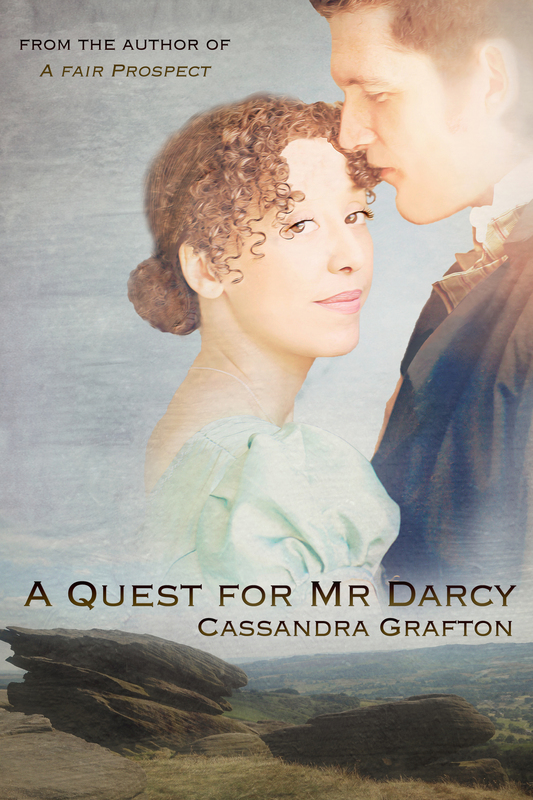 I can’t believe it has been a year since A Quest for Mr. Darcy started going live. Thank you for bringing us along on the journey. I would like the 10er of Jane because I don’t see myself being able to go over and get one anytime soon, but I would be just as happy to cheer for the person who does get it. The year has gone so fast, Lauren! I do miss the online posting and thank you for joining me on the journey! Lovely sentiments, and I wish you good luck in the draw! Hmm…why would I NOT want a note with Jane Austen on it? I’m collecting quite a bit of Jane Austen stuff and I love it! What a great thing to add to my collection! Why not indeed, Leah! Good luck! Why do I want one of those notes…just because it is Jane Austen! Do I need another reason? I did visit Great Britain and Ireland in Spring 2004 but that was before I found all the JAFF and JASNA phenomena. Thanks for the chance to win. I live in USA so cannot easily acquire one of the coveted notes. I visited England a few years ago, and went to as many Jane Austen sites as I could fit in. I won’t get there again I’m afraid. I read Emma in summer after junior high school, and have loved Austen’s books ever since. I’m active in JASNA and wear recency gowns to events. I named three cats Emma, Lizzy, and Harriet. I’d love one of the notes. Thanks for the opportunity. Love the blog! Love the names of your cats, Debra! So glad you enjoy the Blog (though I’ve been a bit remiss in posting this summer – it’s not been a good one, I’m afraid, at times). What a wonderful giveaway! The notes are stunning although I do not like the quote used at all. We just must find humor in it as Jane Austen probably would. Wow! I would LOVE to win one of these. I’ve been wanting one since I first heard about them and wondered who I could bribe in the UK to send me one. Winning one would be even better. I live in the US, but I love everything Jane Austen related- I even have Jane Austen themed socks! I’m a budding writer, and the book I’m working on now includes nods to Jane Austen and her characters. She’s a huge influence in my life, and I would be honored to win one of these! Thanks! LOL re the bribing, Annie! Good luck with the book and also in the draw! Thank you for the opportunity to win this special banknote. Living in the US, it is unlikely I will ever come across one. Then I wish you lots of luck in the draw! Thank you for this wonderful giveaway! I want one because Jane Austen is my favorite author. No better reason could there be, Fabi! Good luck! What a lovely giveaway! I love anything and everything Jane Austen, so if I were lucky enough to win, I would frame it and give it a place of honor in my home. Thanks very much for the chance to win one! I plan on framing mine too, Pam – just looking for the write one! I loved seeing where you took the idea for Mr. Bingley’s additional sisters–so fun!! And I absolutely adored Quest–reading each new chapter was the highlight of my week! I have no way to get a Jane Austen ten. I live in the US. I have been a Jane Austen fan for over 20 years. It started with one viewing(in one sitting) of the ’95 version of Pride and Prejudice as a teenager. I was hooked for life! I have worn out two and half copies of the ’95 version of P&P, collected every other version of every Jane Austen or related movie and book, and it never grows old. Mr. Darcy and Elizabeth, Colonel Brandon and Marianne, and Captain Wentworth and Anne – how can one not love stories like this! LOL re wearing out your copies of P&P 95, Anna! That’s so funny! I have asked several people to get one for me to no avail. I probably wont win one of these because there are others that want one also. However; if you Miss Cass have connections in London I am more than willing to send you the money for both buying one through your contacts and the S & H. That way I can definitely have one, even if its not a new one I would be thankful. Thanking you in advance. Oh, I’m sorry no one was able to get one sent to you, Mari! What a shame! Good luck in the draw, and if you don’t happen to win, I’ll email you about your suggestion! Good Morning…Hope you are having a wonderful Sunday. I must say you are a Class Act, you always take the time to respond to everyone. I look forward to hearing from you to help me get one of the bills through your connections. I see so many wonderful people here who should win I don’t mind not winning as long as you can help me get one I will be a happy camper. Thanks! Thank you for offering this giveaway! First of all, I am not in the UK so like most of the commenters said, this is one of the limited ways I can get my hands on one of these notes. Jane Austen to me, symbolizes hope in humanity. My favourite book, Pride and Prejudice, reflects this theme. To have her picture commemorated in a currency in her beloved country is, to me, one of the highest honours an author could receive and I would like to have this as a momento, to be preserved and cherished. It is indeed such an honour, Casey, I agree! As there is little likelihood of my being in a position to acquire such a lovely token , I would be thrilled to be one of your recipients. BTW: the twins are quite possibly the most delightful new characters in an JAFF that I have read (and that is quite a number!) Would love to see them appear in another of your books! Awww, Regina, you touch my heart! I am so happy you loved the twins so much. Thank you for saying such a lovely thing. I have a few people who’ve said they’d love to see more of them. What a wonderful gift for someone to win through the generosity of yourself . I read “Pride and Prejudice” at the age of ten (70 years ago) and loved her since then and her writings. I have been reliving those memories through P & P variations for quite a few years and have read over 700 of them. Each brings a joy to my life. I no longer travel to age and health but it would be an honor to win one of those bills. … Whether I win or not, I wish you luck in all your writing endeavors and best wishes to all who enter. Wow, Mary Ann! Over 700 variations read? Well done to you! That is true dedication to the joy Jane Austen has brought to so many writers and readers! Thank you so much for the good wishes and good luck in the draw! Oh!! How exciting!! So many of us are not in the position to obtain such a delightful piece of Jane Austen history! Good luck everyone!! I wish you lots of luck in the draw, Sharon! Thank you so much for the kind words, Jen! I really valued your support during the writing of the book! What a wonderful way to celebrate and a very generous giveaway! I loved this story and the twins in particular. It was refreshing for Bingley to have some relations worth spending time with! I would love to win the notes as I will likely not have any other chance to get one. I have a coin and bill collection from around the world, but nothing yet from the UK. Having Jane represent the UK would be amazing! Good luck in getting a £10 note to add to your collection! I’m just stopping by to leave some more love for your wonderful book as I live in the UK. I have several of these notes and because of the style they certainly look to be in mint condition. Like Anji I have found it difficult to force myself to spend them but I suppose I will have to soon. Obviously please don’t enter me in the draw and good luck to everyone who wants one. Aww, Glynis, you are so sweet to say that. Thank you for the good wishes to everyone! I would like one because it will be years before I am able to travel to Britain. I am not sure how long they will be in circulation. I would like it because I like how much the Brits appreciate their writers. I don’t know how long either, though I doubt it will be changed for some years. I do hope you get the chance to visit Britain in the interim. Jane Austen is the first female writer to be depicted on our currency! Such an honour! Thank you for this great giveway. I’m dying to get my hand on one of these £10 notes, especially an unused one. As I’m not living in the UK I unfortunately can’t get one. I’m thinking it would look great on my JA shelf. I think it would too, Assya! Were I to have a “virginal” Jane Austen “note” I would frame it, and hang it in my office, just to the left of my computer, so I could look to Jane for inspiration many times per day. I will be framing mine too, Beth! Glad you enjoyed the ride last winter, Suzanne! The notes are SO pretty! Good luck in the draw! Wow, I would love a mint Jane Austen note! If I won, I would give it to my Literature Major and Librarian daughter, Rachel. She would most likely squeal, kiss it, kiss me 🙂 , frame it and hang it in her home library. Wow, I hope I could a this Jane Austen £10 Note! I have first read Pride and Prejudice since high school, and Jane Austen has not stopped consuming me since then… it would be an honor to have this in my Austen collection… wow. Thank your for this chance again, Cass! My pleasure! Good luck in the draw! Reading Quest as a serial was almost painful, waiting impatiently each week for the next installment. I often went back and read the previous chapter to ensure continuity, so it probably took me longer to read than most people. I’ve reserved JA coins and paper at a currency business here in USA, but their “yes we’ll be getting them” has turned into “eventually.” Still waiting after several months. I’d love to own one and don’t see that they’ll be available in USA any time soon. It’s very generous of you to offer this giveaway, but as I recall you (and Ada) have done some very generous giveaways before. BTW did I thank the two of you for the lovely autographed bookplate? Oh right, why do I want one? To frame and hang on the wall in my house’s tea room/library over the sofa where I do most of my reading and sipping. It would be almost like having Jane and Cass over for tea! Lovely reasoning, Janis! Though I do hope the US business delivers if you don’t win! Yes, you did thank us for the bookplate! Glad it arrived safely! How could I not want one? I was so disappointed to find out that they were not to be released until months after my trip to the UK this year – it would have been such fun to get one while I was there. Anyway, it would go so nicely with my 2£ Jane coin, and fit right in with my collection of all things Jane! Good luck in the draw, Sandy!! PS–I love that you recognized the ATM in Bath! Boy, you really do know that city! I love the Quest for Mr. Darcy. It is on the favori†es list. The Jane Austen note would be special. Here in the USA it would be a souvenir keepsake rather than something to spend, at least for an Austin lover. Thank you. Best Wishes. Congratulations on celebrating your first anniversary, Cassandra. I have never been to England this few years (until my health is stronger) so I may not have the opportunity to collect one if it goes out of circulation. So I would be thankful if I could win it now. Thanks so much for the lovely giveaway, Cass. Thank you! I hope you feel stronger in time and get that trip there! In the meantime, good luck in the draw! What a wonderful giveaway! I would love to win one since I doubt I’ll ever get to visit England. Congrats on your book anniversary. Quest is still on my TBR list but I hope to read it soon! I hope you enjoy it when you get round to it, Kim! 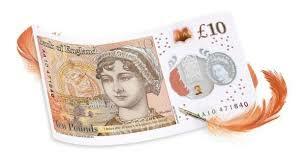 I want a Jane Austen ten pound note because I adore Austen and I think the artist did a good job of making her only verified portrait that her family dismissed as not a good likeness into something that is a reasonable imagining of what she looked like from family reports. In other words, my reason is I like the picture! Hahaha! I like the rendition of Jane too, Suzan. I know it won’t please everyone, but I’m happy! You know, I’m so in love with your book. And I liked your comment for the Mr. Darcy’s Pemberley book. I ordered one already for my friend – as a Christmas gift. What will your next Book be? Waiting! Thank you for the kind words re Quest! You will love the guide to Pemberley. I ordered one as a gift too! Working on the sequel to Particular Charm right now! The Particular Charm of Miss Jane Austen. It’s a contemporary cosy mystery/romance set in Bath during the Jane Austen Festival! 😉 The only Mr Darcy in it has four legs and they are furry! I loved the twins. They were such fun and a lively addition to lighten things up when needed! Winning one of these notes would be a wonderful gift for my 75th birthday today. It’s a very nice gesture, Cass. My pleasure, Betty! Good luck – I’m doing the draw today at some point! This draw is now closed to entries. The two winners will be picked later today and announced here on the Blog!